Amphibians are the extant descendants of the first vertebrate class to successfully colonize terrestrial environments; hence they occupy a unique position between fish and reptiles. Amphibian skin provides essentially no resistance to evaporative water loss, and consequently daily water turnover rates are an order of magnitude greater than in other terrestrial vertebrate groups. This has led to a suite of physiological, morphological and behavioural adaptations thathave allowed a successful terrestrial existence in spite of this apparently spendthrift water retention strategy. Ecological and Environmental Physiology of Amphibians provides a synthesis of current research on the comparative physiology of amphibians with a particular emphasis on water balance. It adopts a strong environmental perspective and includes a wealth of information on ecology, phylogeny and development. 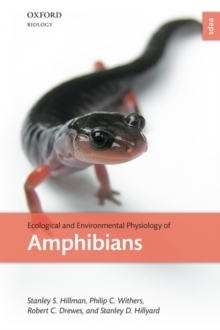 As with other books in the Ecological and Environmental Physiology Series, the emphasis in this book is on the unique physiological characteristics of the amphibians, although thelatest experimental techniques and future research directions are also considered. This accessible text is suitable for both graduate students and researchers in the fields of amphibian comparative physiology and physiological ecology, including specialist courses in amphibian ecology. It will also be of valueand use to the many professional herpetologists requiring a concise overview of the topic.